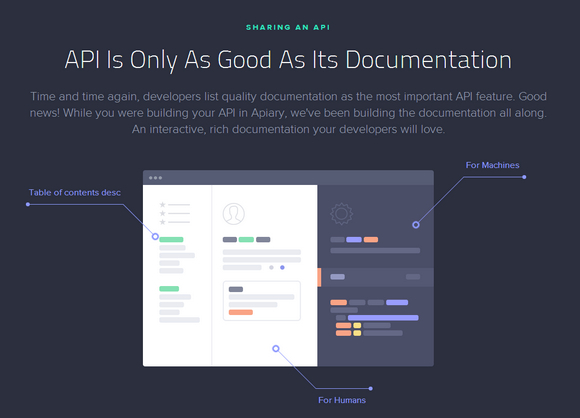 Apiary helps you build beautiful APIs with collaborative design, instant API mock, generated documentation, integrated code samples, debugging and automated testing. Apiary is powerful, open sourced and developer-friendly. As easy as writing Markdown, but comes with a mock server, tests, validations, code samples and your language bindings. A server mock is a quick way to experiment with an API – even before you start writing code. Two clicks will link Apiary to a repository of your choice. It’s up to you whether you make the API Blueprint private or public and let community to contribute. They update your doc on each commit, and they push commits to the repo whenever you update your documentation at Apiary.